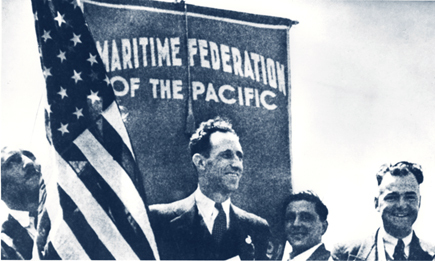 Harry Bridges stands before a Maritime Federation of the Pacific banner, circa 1935. Formed in 1935, the Maritime Federation of the Pacific (MFP) joined together longshoremen and seamen to expand the gains longshoremen won in the 1934 strike to all maritime workers on the West Coast. The MFP succeeded in these goals in subsequent labor actions, notably the 1936-7 strike. The Voice of the Federation, the official publication of the MFP, was vital for communicating the organization’s message and a place for the MFP member unions of different trades to express their viewpoints and publicize their interests. In the years following the 1934 strike, the Voice of the Federation served as the main organ for the Pacific Coast District of the International Longshoremen’s Association (later, the ILWU). Due to internal conflicts, the Maritime Federation’s promise of unity was short lived. With the demise of the Maritime Federation, the ILWU began publishing its own paper, The Dispatcher, in 1942.